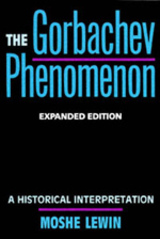 The "Gorbachev phenomenon" is seen as the product of complex developments during the last seventy years—developments that changed the Soviet Union from a primarily agrarian society into an urban, industrial one. Here, for the first time, a noted authority on Soviet society identifies the crucial historical events and social forces that explain Glasnost and political and economic life in the Soviet Union today. Moshe Lewin is Professor of History at the University of Pennsylvania and the author of several books on Soviet history.